Great progress on both Sampler Lady and Sweet Treat, though i do think she will look better with a head lol. SL is looking great, even with out ahead. Can't wait to see her, body complete. Don't think you need any photography lessons, you're pictures are looking fantastic. It would be interesting though, you may find out a few new things. Sounds like a great idea and a lot of fun. Sampler Lady looks good but will look better once she has a head! i also like your new blog layout its pretty and sorta matches your stitching! 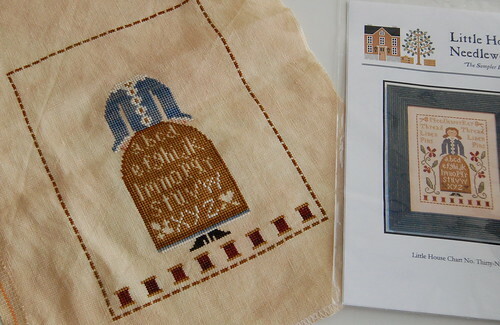 Great progress on the Sampler Lady, I look forward to seeing her complete. I bet she's complete by now? Right? You do lovely work, fast and precise and take the best photos, any class you take can only make your photos looke better and better...please share some photography tricks with us when you have a chance! The linen colour is very beautiful! I think you take great pictures already :) My blog pics tend to look so lifeless... sigh. Anyway, the class sounds like fun!